I was sent the Tinted Tan Mousse - Medium which is £14.95 (but only £6.72 exc. delivery when you use my discount code (see end of post)). The mousse texture meant it blended beautifully and the tanning mitt allowed a streak-free application as long as I made sure to blend the edges out before it dried. It does dry very fast which is a great advantage as you don't have to wait to get dressed or go to bed in fear of stained sheets! The 'zero smell' claim was mostly true as it was odourless during application, however I could smell a tinge of that biscuity scent during showering. Hopefully my white-as-snow legs haven't blinded you! I was really pleased with the intensity and hue of the tan from just one layer. It definitely wasn't orange and provided good even coverage. 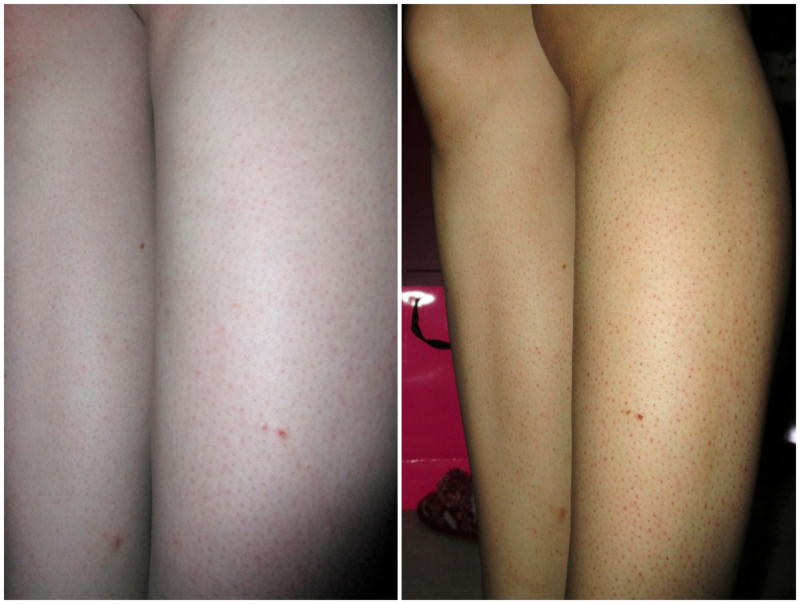 As you can probably see, I have 'strawberry legs' and I found the tan did emphasise this. It also stuck rather oddly to a dry patch of skin I have from a shaving accident - but that's my own fault! Aside from the strawberry legs, which I am hoping to fix with this article, I was really pleased with how my legs turned out. My last fake tan experience left them streaky but this time was much better. I would confidently flaunt them if it wasn't for winter and my 600 denier tights! The tan applied evenly on the rest of my body, including my rather hairy arms! Although elbows and knees are meant to be tricky spots, I didn't find either of these a problem, although my feet were a little darker than the rest of me. As for the 'fades perfectly' claim, I did notice the water in my first shower was tinted brown, however there was no noticeable change once dried. The tan lasted about five days which was two days short of what the bottle claimed, however I did have a bath with lots of bubbles which probably contributed to this (read about the LUSH bath bomb I used here). In order to match my face to the rest of me, I used Collection's Lasting Perfection Foundation in Porcelain (which is definitely not the shade of white porcelain!) and bronzer. And don't worry, I did blend it onto my neck. Overall, I think the NKD SKN collection is a fantastic affordable option for those wanting an easy but gorgeous fake tan. You can browse the whole range and if you enter my code WISHED45 at checkout, you'll receive 45% off on your total order! That's a pretty good deal if I do say so myself, so why not try it out or buy some as Christmas presents! Hurry though, the code expires on December 5th. Good luck with your tanning adventures!